What a perfect match: the world’s greatest “saloon singer” eulogized superbly by the author of The Drinking Life (1993). Hamill knew Sinatra, nearly co-authored the singer’s autobiography, and in preparation for that never-to-be-written volume, the duo had many long conversations. But this slender volume, an essay really, is not the collection of revelations and self-justifications that a ghosted autobiography might have been. Rather, it’s an unusually thoughtful contribution to the growing body of literature of appreciation of Sinatra as an artist, a supreme interpreter of the great American popular song. Hamill has a good journalist’s finely tuned antenna for the Zeitgeist. In his recounting of Sinatra’s career (the author limits himself tellingly to the rise to stardom, the disastrous fall in the early 1950s and the comeback shortly after), Hamill’s antennae get a useful workout. More than almost any other of Sinatra’s critics, he understands the centrality of the immigrant experience (both Sinatra’s parents were born in Italy), Prohibition, and the Second World War to Sinatra’s career and his meaning as an icon. At the same time, Hamill is savvy enough to know what he doesn’t know; like any good reporter, he relies on well-chosen expert testimony to fill in the blanks, here mostly in technical matters of music-making. And while Hamill is clearly not an entirely objective observer, a point he addresses with candor, this is anything but a bronzing. 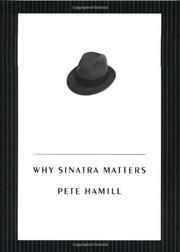 The essay touches on Sinatra’s failings with frankness (no pun intended), and if the author dismisses the stories about Sinatra’s Mob ties a little too quickly to satisfy some carpers, he does so with a deft intelligence that brings us back to the most important point: “In the end only the work matters. Sinatra’s finest work was making music.” Despite its brevity, Why Sinatra Matters belongs in any collection of important books on American popular music of the 20th Century.